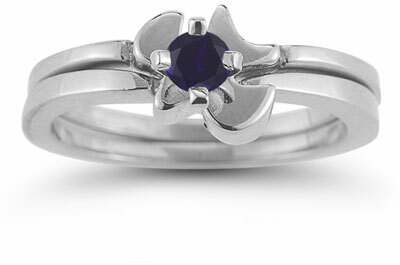 The Holy Spirit Dove Sapphire Engagement Ring Set is a testament to true devotion. With a sacred-inspired design, the Holy Spirit is represented as a delicate dove spreading its wings to wrap around an unassuming sapphire (5mm) as the center stone. This round-cut gemstone needs only a faint sparkle of light to come to life and reflect an image of precise blue beauty. The sapphire stone is positioned atop a set of white gold rings, each band measuring 2.8mm in width. The clean lines of the double band provide a supportive base that enhances the curving wings of the dove placed above it at the center. Light and shadow play together on the shimmering white gold, reflecting off the stone. Blue is a color long known for its physical and spiritual communication, and this sapphire ring set brings these qualities to life. Not only does it serve as a reminder of purity and joy, the design also conveys a comforting message of caring and eternal love. It speaks of commitment and surrendering yourself to another. We guarantee our Holy Spirit Dove Sapphire Engagement Ring Set to be high quality, authentic jewelry, as described above.